I'll paste my response from IRC here since it is relevant and I'll add a few more thoughts. cremes:cosmoharrigan_: how is the response sent back via the callback? If it's via that single DEALER socket and the callback runs in another thread, you need to protect the socket with a mutex. [3:46pm]cremes:Best to just give each thread its own socket. It's a cleaner design plus it let's you push thread & lock management into zeromq. 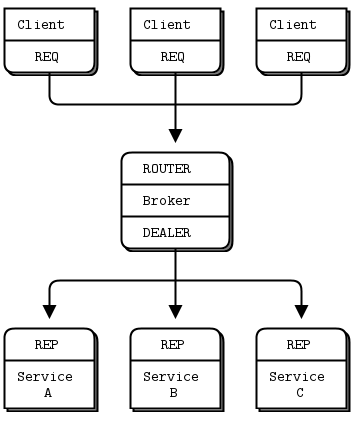 If the reply from the callback needs to be routed back to the client, you should continue to use DEALER(client) <-> ROUTER (broker) <-> DEALER (worker). In this case there is a single worker but the message passing works exactly the same. > I want to implement a design similar to the Request-Reply Broker from the zguide (https://raw.github.com/imatix/zguide/master/images/fig17.png) but instead of having multiple workers running ahead of time, I want to have one worker that receives all the requests, and spawns asynchronous operations (tasks) to handle them and send the responses.